Spy Hunter is a 1983 arcade game developed and released by Bally Midway. It has also been ported to various home computers and video game systems. As a cabinet-style arcade game, Spy Hunter was produced in both sit-down and standard upright versions with the latter being more common. The game's controls consist of a steering wheel in the form of a futuristic aircraft-style yoke with several special-purpose buttons, a two-position stick shift (offering 'low' and 'high' gears), and a pedal used for acceleration. It is a single-player game. Spy Hunter is a vertical scrolling action/driving game with the player in the role of a spy driving an armed sportscar. The object of the game is to travel the freeway destroying as many enemy vehicles as possible while protecting civilian vehicles. The game uses top-down perspective. 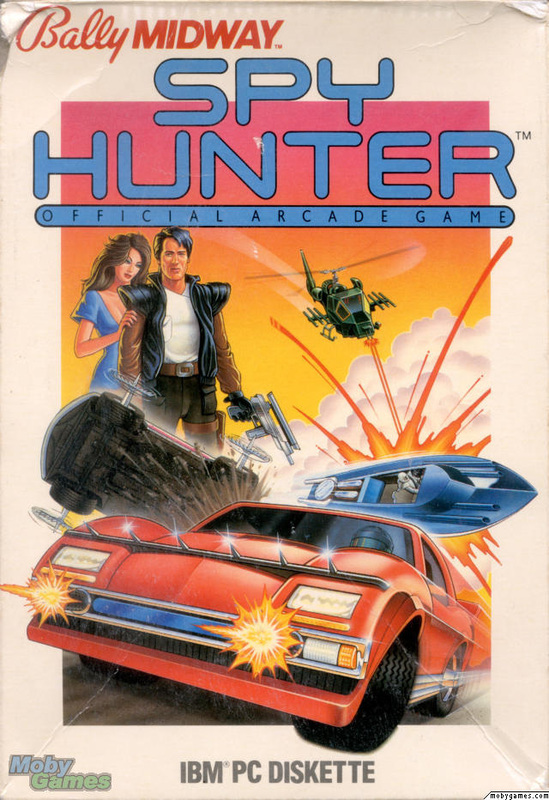 The game begins with the player driving the fictitious G-6155 Interceptor. Various enemy vehicles try to destroy the player's car or to force it off the road, including a helicopter that drops bombs from overhead. A counter increments the score while the car is moving and on the road. Additional points are earned destroying enemy vehicles using weapons or by forcing them off the road. After an initial lead-in time during which the player has an unlimited supply of cars, the player must earn extra cars by obtaining high scores. Destroying non-enemy cars halts the score counter for a short while, and no points are scored whenever the player's car is off the road. The car can be destroyed by a hard collision with another vehicle or if it is hit by an enemy weapon, including the craters blasted into the road by the helicopter's bombs. Following periodic forks in the road, players can enter a new 'territory' with different terrain and/or weather conditions. Players can also upgrade the car's standard machine guns by adding other weapons by enterting the Weapons Van, which appears in each new territory and can be periodically summoned by pressing the blinking "Weapons Van" button. Three special weapons are available: oil slicks, smoke screens, and surface-to-air missiles. Each has limited ammo and are lost if the player's car is destroyed. The game's dashboard shows which weapons are available, when lit. It is possible for the player to convert the car into a go-fast boat for brief periods by driving through a special boathouse which appears infrequently at the side of the road after which the player is attacked by two different enemy boats.